Author Janet Lee reveals six small space storage solutions as valuable to apartment renters as they are to homeowners. Over the past 20 years, author, blogger, and television producer Janet Lee has lived in a dozen small apartments, none of them larger than 750 square feet. Small wonder that she’s earned a wealth of knowledge about making the most out of less-than-spacious spaces. 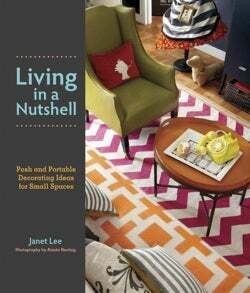 Through her blog, Living in a Nutshell, and her book, Living in a Nutshell: Posh and Portable Decorating Ideas for Small Spaces, Lee offers advice on maximizing the real estate you’ve got, however limited it may be. 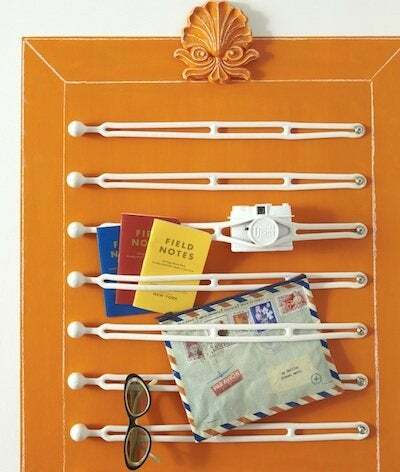 Her small space storage solutions reveal your home’s hidden storage potential. The storage-starved among us typically leverage the space above the refrigerator. Lee suggests organizing items you keep here into coordinating boxes. Or if the appliance occupies an unusually tight space, install a curtain that extends down only low enough to conceal the loose collection of items the top of your fridge holds. Capitalize on the fact that guests so rarely see the back of your folding screen: Add over-the-door shoe bags or hang a laundry bag from a small hook. Of course, the room divider must be sturdy enough to support the weight of whatever you choose to hide behind the panel; wood-framed designs are ideal. Transform tiny hallways and foyers into stylish catchalls with this inexpensive trick: Stretched across a wall or frame, rubber boating straps can support mail, keys, small toys and shoes—any possession you want to keep within arm’s reach, ready to be grabbed at a moment’s notice. Here’s another great small space storage solution: “When you are trying to maximize your closet’s full storage potential, don’t forget the doorknobs,” says Lee. Hang coordinating tote bags printed with decorative designs to keep stockings, scarves, and socks neatly contained and instantly accessible.